Tens of millions rely solely upon antidepressants to kick a dent in their depression. Certainly no judgment here. However, there’s plenty of comfort and healing to be found when we focus upon our negative thoughts. And Socratic questioning puts it all in motion. What say we dig-in? And so it’s important to discipline ourselves to use SQ in an effort to confront and reason-through our negative thoughts. When we do, we’ll find we’ve overlooked information that contradicts the garbage we believe to be true. Greek philosopher Socrates, out and about some 400 years BC, was one smart cookie. I mean, just look at him in that chair. By the way, did you know he was philosopher and mathematician Plato’s teacher? 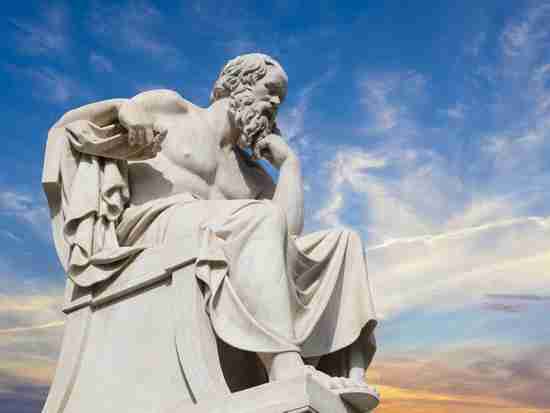 Of his many existing influences is Socratic questioning, also referred to as Socratic dialogue or Socratic maieutics. Now, that’s a $500 word, and its meaning is important to our discussion. Maieutics: of or relating to the method used by Socrates of eliciting knowledge in the mind of a person by interrogation and insistence on close and logical reasoning. Socratic questioning (SQ) can be utilized in a variety of disciplines. And we’re going to examine it within the realm of psychology, specifically depression. I might add that even though the contextual focus here is depression, SQ is just as relevant when it comes to anxiety treatment. A team at The Ohio State University has discovered when psychotherapists use SQ in their cognitive therapy (the front end of cognitive behavioral therapy – CBT) work with depressed clients, substantial symptom improvement is realized. The study details appeared in a recent issue of the journal Behaviour Research and Therapy. Now, we’re going to get into the nuts and bolts of SQ in a bit, but for now, let’s just say it’s about a series of guided questions in which the therapist challenges a client to consider new perspectives on themselves and their place in the world. People with depression can get stuck in a negative way of thinking. Socratic questioning helps patients examine the validity of their negative thoughts and gain a broader, more realistic perspective. We found that Socratic questioning was predictive of symptom improvements above and beyond the therapeutic relationship – the variable that has been most examined in previous studies. So here’s how it went down. Fifty-five participants took part in a 16-week course of cognitive therapy for depression. When it was all said and done, the team analyzed video recordings of the first three sessions for each participant and estimated how often the therapist used SQ techniques. And go figure, the sessions in which more SQ was used generated a greater improvement in pre-measured depressive symptoms. According to Braun, it was obvious the participants were learning the process of asking themselves questions and, in fact, becoming aware, and skeptical, of their negative thoughts. For all of us, the more that occurs, the more we can anticipate symptom improvement. In short, it’s a disciplined style of questioning used to explore complex ideas, get to the truth of the matter, open-up issues and problems, uncover assumptions, analyze concepts, distinguish what we know from what we don’t, and follow-out logical implications of thought. So how does SQ differ from regular questioning? It’s systematic, disciplined, deep, and typically emphasizes fundamental concepts, principles, theories, issues, or problems. Used in several therapies of note, we’re going to discuss SQ within the context of cognitive therapy – just like the study. SQ is used as a cognitive restructuring technique to uncover, challenge, and negate the beliefs, assumptions, and evidence in which our problematic thoughts are grounded. Cognitive distortions loom large here. Do you see how SQ works? And, remember, in addition to a therapist asking the questions, we need to be asking them of ourselves! Let me see if I understand you; do you mean ____ or ____? Do I understand you correctly? You seem to be assuming ____. Why would someone make this assumption? Is it always the case? How could we find out whether that’s true? When you say ____, are you implying ____? Would that for sure happen, or just maybe? Is there an alternative way of perceiving this? Do you think consistently asking yourself such questions would challenge and inhibit your negative thoughts? Sure it would. Hey, I could never fault someone for relying upon antidepressants for depression relief. But you have to believe me when I say there’s so much more to the comfort and healing equation. If you’re struggling with depression, I’m going to stick my neck out and say your negative thoughts are mega-contributors. How couldn’t they be? So why not assertively address the obvious dilemma? And you can use Socratic questioning to take care of biz. Thanks to The Ohio State University, author Jeff Grabmeier, for the study info. Other study co-authors: Katherine Sasso and Andrew Cooper. More Chipur mood and anxiety disorder titles? Here ya’ go!